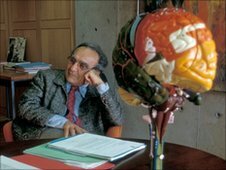 Files released today show that MI5 labelled the scientist and broadcaster Jacob Bronowski a "security risk" for nearly 20 years, writes Sanchia Berg. "It reminds me of the Stasi in East Germany...it would be comical if it wasn't so serious for a man's life." That is the way Professor Lisa Jardine describes the file MI5 assembled on her father, Dr Jacob Bronowski. Bronowski is remembered as a brilliant scientist and broadcaster. His series The Ascent of Man, which was transmitted on the BBC in the 1970s, is regularly included on lists of the best TV programmes of all time. It drew on many different disciplines, presenting a grand sweep of history in a striking, accessible, intellectually exciting way. When he made it, he was head of the Salk Institute in California, a post he had held since 1963. 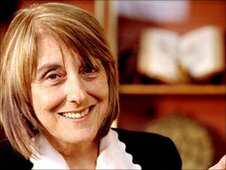 According to Professor Jardine, though, her father had never wanted to leave Britain. Jacob Bronowski loved the country which had given him refuge as a boy of 12. He would have liked a senior academic job here: as head of an Oxford or Cambridge college for instance. That was never offered. He believed it was because he had become a celebrity, one of the first "telly dons". But MI5's fat file on him suggests to his daughter that there could be another reason. The MI5 file was opened in late 1939 because of a tip-off from a schoolmaster whose son had met Bronowski in Hull, where he was a lecturer in Maths at the new University College. The correspondent wrote to the Home Office that Bronowski was "reviling this country" and "extremely left". The local police were asked if they knew of him, and they responded that Bronowski was not, as far as they knew, a member of any communist organisation, and was very pro-British. Then, in 1940, MI5 received another tip, this time from a Professor WE Collinson. He knew personally one of the MI5 officers, a Mr Pilcher, and contacted him directly. He quoted anonymous colleagues of Dr Bronowski who considered him "an agitator of the Communist type" who was "disseminating seditious doctrines". Again, MI5 asked Hull police to help. They sent PC Alfred Foster to observe Dr Bronowski at public events. At one meeting of the Left Book Club in October 1940, the main speaker was a Commander Young, of the Royal Navy. He was very critical of the government, suggesting that they didn't really want to win the war. Many present were very supportive of his view. Several Communists were in the audience: one invited people to continue the discussion at a meeting organised by the party. Dr Bronowski was chairing the meeting: PC Foster heard him say that he was willing to "collaborate" with communists on points with which he had sympathy. Three months later, PC Foster went to a meeting of the People's Theatre Guild. Comedy sketches critical of the ruling classes and of the British Empire were performed. Dr Bronowski read a poem he had written, apparently entitled "How I hate war". The police officer could not hear it clearly, but he thought it was about the Cote D'Azur, complaining that the rich and powerful did not visit any more. However, in his reports he described this as "an extremely pacifist poem" and concluded that "Bronowski is a communist in all but name". This formed the basis of MI5's vetting reports for many years. Bronowski was not a member of the Communist Party, nor Young Communist League: he did not attend their meetings, and nothing else incriminating was found, aside from some rather flimsy evidence from a phonetap of a known Communist. But MI5 continued to use Alfred Foster's quotes for a decade, and warned that Dr Bronowski was a security risk still in the 1950s. In 1943 the Ministry of Home Security were seeking a Mathematician to help with plans to bomb German cities. The calculations were complex. They asked MI5 for their view of Dr Bronowski. The Security Service provided a very negative report, but the department decided to appoint him anyway, as he was the best qualified. MI5 wrote back, warning that anything secret Bronowski saw would go straight to "Communist Party headquarters". Dr Bronowski kept his job, and did it so effectively that he was invited to the US to help advise them on their attacks on Japanese cities. 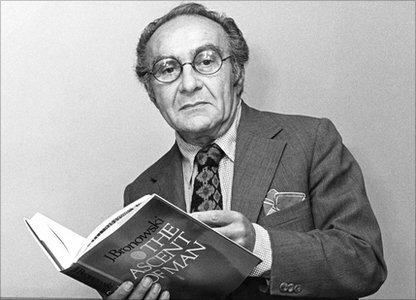 After the Americans dropped two atomic bombs Jacob Bronowski was sent to Japan to observe the after-effects, as part of a British government mission. Just over a year later he spoke on the BBC of what he had seen. His account was powerful, very evocative: it launched his broadcasting career. Meanwhile, MI5's file was having an effect - Dr Bronowski was blocked from working in atomic research, for instance, in 1947. He joined the Coal Board, becoming head of their research into new processes. 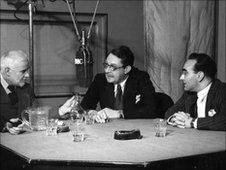 Dr Bronowski was fast becoming a household name in Britain, known for his regular appearances on programmes like the BBC's Brains Trust. He was invited to set up or run universities abroad, but not in the UK. "Over High Table at All Souls [College, Oxford], one gent says to another: "Oh, Bronowski. MI5 have a big file on him". You don't need to say anything more than that."